"...Be it resolved, that the Senate recognize and commend the employees of the Washington State Department of Transportation on their work to maintain our state's transportation corridors during and after the storms of 2007, 2008, and 2009, and the employees of the Washington state patrol on their efforts to assist our residents during the storms of 2007, 2008, and 2009." The men and women like Al who work for WSDOT are very proud of the job they do each day. And it sure is nice for them and their Washington State Patrol colleagues to hear that others appreciate their efforts. But, truthfully, most of them were in a hurry to get back to their trucks and shops. A number of Washington State Senators offered their thanks for WSDOT and WSP's efforts. TVW also broadcast the ceremony live and it's available on their website. WSDOT contractor crews wrapped up a busy weekend of work on southbound Interstate 5 between Stewart Street and Interstate 90 in downtown Seattle. Crews are repairing 40-year-old concrete which is deteriorating and falling apart. Broken concrete means tough traveling for drivers and freight haulers. We want to keep our economy moving. This weekend crews replaced 41 broken and concrete panels and reopened lanes four hours ahead of the 5 a.m. Monday, Feb. 16 target. But the real story is in the numbers and comes from drivers themselves who plugged in, paid attention and took alternate routes this week. The following statistics come from day-to-day comparisons from 2008 to 2009. On Saturday and Sunday, Feb. 14 and 15, nearly 60 percent of the drivers who usually take I-5 and cross I-5 south of Mercer Street did something different. They took SR 99, local streets, I-405 or stayed home. Sixty percent is an extraordinarily large number! That means more than half of you didn’t take I-5. This might be one for the record books at WSDOT. On Saturday, Feb. 14, 8 percent more drivers used the express lanes to get into Seattle than on the same day last year. We have found in the past that the express lanes are the hardest working lanes that too few people use. Only at 10 a.m. did the express lanes take longer to travel than the mainline. On Saturday, Feb. 14, we saw a 23 percent jump in drivers using I-405 as an alternate route to I-5. That is exactly what we wanted. We hoped that drivers traveling through Seattle would take I-405 so drivers traveling to Seattle could use I-5. Back ups on the mainline never reached more than 45 minutes and that was at 4 p.m. on Saturday. The longest back ups Saturday occurred at 1:30 in the express lanes and at 4 p.m. on the mainline. The longest backs up on Sunday occurred at 1:30 in the express lanes and 11 a.m. on mainline. Nearly two-thirds of drivers did not use I-5 to get to I-90. They crossed the lake on SR 520 or they used I-405 from Lynnwood and avoided the bridges altogether. We also saw a 48 percent jump in drivers who used the I-90 exit from I-5 to get off and then back on I-5 after the work zone. It’s called a collector-distributor ramp. It functions like a long bypass. That helped lower the traffic numbers in that second construction zone near I-90. It was the same story on Sunday. Drivers listened to the radio and make smart choices. During the carjacking on I-5 Saturday the I-5 mainline was closed for the investigation. Drivers used the express lanes and SR 99 to get around the pinch point and made it to their destinations. We will close northbound I-5 this weekend from Friday, Feb. 20 at 8 p.m. through Monday, Feb. 23 at 5 a.m. just south of the I-90 interchange. We hope drivers will do a great job again this weekend. Watch this spot for your traffic congestion report card next Monday. If I told you there is an epidemic taking more than 100 lives a day would you be afraid, inquisitive, alarmed, outraged? Just over 100 people on average die each day in the United States as a result of car crashes. This epidemic is taking the lives of mothers, fathers, children, brothers, and sisters. The recent coverage of air travel from the NTSB hearing on medical helicopter safety, to the miraculous landing of the airliner in the Hudson River, to today’s unfortunate and tragic airliner crash into a home in Buffalo, NY all highlight the obstacles ahead of us striving to reduce traffic related deaths and injuries. Are car crashes deemed unavoidable or simply seen as the price we must pay for mobility? There is no doubt both of these plane crashes deserved a great deal of attention, but where is the public outcry and attention for those who die in car crashes? I would argue if 100 people died each day as a result of national air travel in the U.S. there would be a public outcry to make air travel safer. The question remains as to how we harness individual outrage over traffic related deaths and injuries into a public outcry that can’t be ignored. Did you know that the Winter Olympics are only one year away? Did you also know that we’ve been planning and preparing for the Olympics for several years? Chances are high that you knew the Olympics were drawing near. But you’re probably scratching your head and wondering why we would be preparing for them. I mean, we’re in Washington and the games are in Canada; two different countries, right? What’s there to prepare for? I was recently interviewed by Chris Daniels from KING 5 about our preparations for the 2010 Vancouver Winter Olympics, and thought I would share with you what I shared with him. We are expecting many Washingtonians, and probably a few Oregonians and Californians, to flock north across the border for the excitement, and that means we’ll see a significant increase in traffic on highways that connect with the Washington/British Columbia border. We’re planning for a 50-percent increase in traffic during the Olympics. That’s like having August traffic in February. On average, 250,000 more drivers cross the border by vehicle in August than in February. That’s a significant increase. As of 2008, we have beefed up our traveler information system near the border. We’ve added 11 new traffic cameras, upping our total to 17. We now have cameras pointed at all four border highways so you can monitor traffic congestion. We’ve also improved our border wait time information system. Wait times are now displayed on overhead electronic signs along I-5, our Web site, and can be accessed via text message. With four border crossings in Whatcom County, you can find out which one has the shortest lines and will take the least time. In 2003, the Legislature passed a transportation funding package that included money for a project on I-5 in Everett and projects on SR 539 between Bellingham and the border. Those projects were originally scheduled to be in construction during the Olympics, but both routes will be primary thoroughfares during the games. Foreseeing a potential disaster, we petitioned the Legislature to advance funding for the projects so that we could start and finish them before the Olympics. The I-5 project was completed last year and the second of two projects on the Guide will finish this fall. Phew! Crisis averted. Taking things one step further, we have also scheduled an additional 70-plus personnel and 30-plus pieces of equipment to be in the Whatcom County area during the Olympics (Feb. 12-28). We figure we’ll need the help with traffic control, clearing collisions, fighting snow, ice and/or floods, and anything else that could possibly arise. I know it seems weird, but we have been planning and preparing for the games since we first learned they were coming to Vancouver. We want to take the gold for being a good neighbor. As far as our work is concerned, we’ll be finished and out of the way of drivers by the time February 2010 rolls around. Hopefully that will help make the Olympic experience that much better for those driving there. The interview is supposed to air on Feb. 12, the one-year date before the games start. It's not what you think. 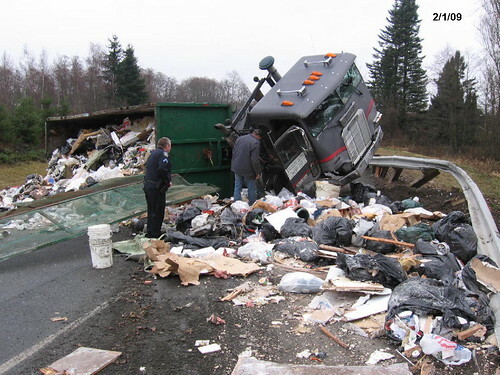 I-5 was literally trashed by an overturned garbage truck the day of the Superbowl. Shortly before 11 a.m. Sunday, Feb. 1, a truck hauling garbage overturned on the on-ramp to I-5 in Blaine, spilling its load. Trash was strewn all over, creating a mess. Area 1 maintenance supervisor Ric Willand said, "You can imagine how hard it was to get a hold of people to respond and clean this mess up on Superbowl Sunday. How dare he roll a truck on the day of the Superbowl!" Despite it being Superbowl Sunday, Willand was able to contact two employees and get the mess cleaned up. Crews used a sweeper and loader, and the trucking company brought an empty dumpster, and it was all cleaned up by 2:30 p.m. There have been several significant media-reported accounts about the National Transportation Safety Board (NTSB) hearing on medical helicopter safety. In light of revealed information indicating that in 2008, 29 people died in emergency helicopter crashes an NTSB Board Member said, “The recent accident record is alarming and it is unacceptable.” In contrast to the number of deaths each day from highway crashes and the manner in which the media and public view them, the difference is most striking. This overwhelmingly underscores our challenge and the different prevailing culture between air safety and traffic safety. Seismic bridge retrofitting: And you didn’t even know it! Winter is barely halfway over, but here at WSDOT we’re quickly transitioning into construction season. If you’re familiar with WSDOT projects, you know what that means: you’ll see the signature orange of our traffic cones, construction barrels, and safety vests as crews get to work improving our state highways. What you might not know is that our construction activities aren’t limited solely to large, visible projects. Some of our projects are barely noticeable to freeway drivers, and you may not have realized that we’ve been working under your feet (er, car) all along. In fact, if you’ve traveled on I-5 from Seattle to Everett lately, you’ve driven right over one of our active construction sites. Since October 2008, crews have been working to retrofit 19 bridges (overpasses and underpasses) on I-5 between Tukwila and Lynnwood, and are currently working in both Tukwila and Mountlake Terrace. In plain English, seismic retrofitting means improving a bridge to protect it against future earthquakes. Although these bridges are all structurally safe for everyday traffic, simple upgrades can go a long way towards keeping the bridge intact and motorists safe in the event of a large earthquake. So how has this work progressed without you noticing all those orange barrels and construction equipment? The trick is that construction occurs beneath the surface of the roadway, focusing on bridge columns, crossbeams and girders. Column jacketing – installing a metal jacket around the bridge column. If a concrete column were to crack during an earthquake, the metal jacket would hold the pieces together, preventing the column from crumbling. Bolster retrofitting – extending the crossbeam to prevent girders from slipping off sideways during an earthquake. Girders support the roadway, so it’s important to keep girders intact. Girder stops – installing concrete blocks on either side of the girder to stop the girder from sliding or tipping over. In addition to the 19 bridges that are slated for improvement as part of the I-5 project, there are more than 900 bridges across the state that will be improved as part of the Seismic Retrofit Program. For more information, take a look at the project Web site or the statewide Seismic Retrofit page. Editor's note: post written by Aurora Jones.